The bestselling Hero’s Welcome series continues with a juicy Christmas romance, a short novel set in Seaside, North Carolina, where the bustling military base keeps this small town stocked with dedicated, lovable heroes. Three-hundred-and-sixty-four days a year, Allison Carmichael doesn’t mind being single. It sure beats dating another loser, and it keeps her heart safe. Then there’s that three-hundred-and-sixty-fifth day: Christmas Eve, the traditional time her entire family gathers together—and gangs up on her, demanding to know when she’s going to get married. This year, she swears, is going be different. And that’s why, at a charity auction she’s throwing on-base, she buys herself a man. Sergeant Troy Matthews insists that he’s not for sale. His time is, though, and he’s happy to donate it. Happier still when he learns the identity of the winning bidder: the redhead with the killer good looks and smart mouth who runs the veteran’s center. Allison needs Troy’s help to fool her family into believing they’re an item, and he’s all too happy to indulge her. But by the time Christmas Eve rolls around, their little charade is working a little too well... because Troy’s falling head over heels. Allison is sweet, kind, but a major pushover. I have a difficult time connecting with characters who are strong in one aspect of their life, but noodles when it comes to family. Despite that, Allison's job is her life – she is dedicated and will stop at nothing to find ways to make Christmas the best for kids who, otherwise, would not have a Christmas. Troy is a military police officer and he has doesn't usually like going to parties around the holidays. He has family who he doesn't normally see because he and his brother had a slight falling out. When he is "won" by Allison – he's somewhat hesitant, but understands her need to attend a holiday party with a date, but also sees an opportunity to get to know her better. Overall, this was a super short, holiday read. It was sweet, but overall, there was not a lot of development of the main characters. Annie Rains is a contemporary romance author who writes small-town love stories set in fictional towns on the coast of North Carolina. Raised in one of America’s largest military communities, Annie often features heroes who fight for their country, while also fighting for a place to call home and a good woman to love. When Annie isn’t writing, she’s spending time with her husband and three children, or reading a book by one of her favorite authors. 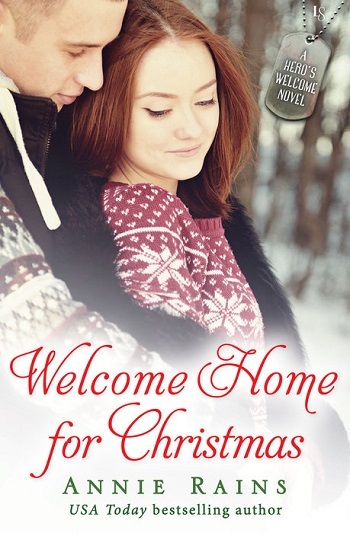 Reviewers on the Wicked Reads Review Team were provided a free copy of Welcome Home for Christmas (Hero's Welcome #4) by Annie Rains to read and review.